SAO PAULO: Argentine goalkeeper Sergio Romero saved two penalties in a shootout with the Netherlands on Wednesday to take his country through to the World Cup final for the first time since 1990. 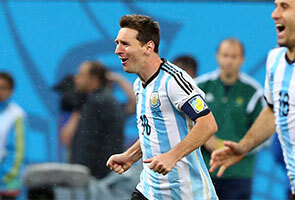 Lionel Messi's Argentina beat the Dutch 4-2 in a penalty shootout after their cagey semi-final in Sao Paulo finished goalless. They play Germany in Sunday's final in Rio de Janeiro. The drab match was the polar opposite of Germany's 7-1 annihilation of Brazil in the first semi-final 24 hours earlier. But Romero, who barely played for his Monaco club side last season settled matters by repelling spot-kicks from Ron Vlaar and Wesley Sneijder. It was the second time that Holland, who lost the 2010 final to Spain, were beaten on penalties in a World Cup semi-final. They fell to Brazil in 1998. "We have given everything and I'm incredibly proud of this team," Dutch star striker Arjen Robben said after. 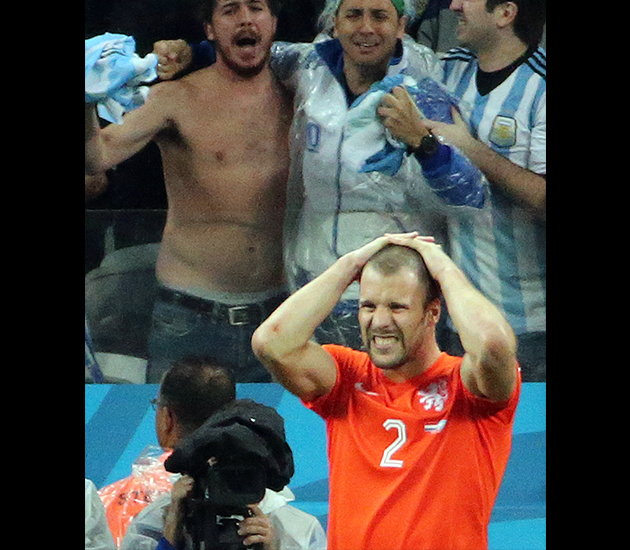 The result was particularly cruel for Vlaar, who marshalled his defence imperiously throughout the game. Messi had no answer to the Aston Villa centre-back's decisive interceptions, but the Barcelona superstar can nonetheless still hope to confirm his greatness in Rio de Janeiro on Sunday when he appears in his first World Cup final. Although reserve goalkeeper Tim Krul had saved two penalties in Holland's shootout success against Costa Rica in the quarter-finals, coach Louis van Gaal kept faith in Jasper Cillessen this time. Romero's saves from Vlaar and Sneijder put Argentina in a commanding position and with Messi, Ezequiel Garay and Sergio Aguero all scoring, it was left to Maxi Rodriguez to dispatch the spot-kick that sent Argentina into the final. It was only Argentina's second win over the Netherlands in nine attempts -- their first since the 1978 World Cup final -- and it enabled Messi and his team-mates to pay appropriate homage to Argentine great Alfredo Di Stefano, who died on Monday aged 88. Ten days after effectively being ruled out of the tournament with a torn groin muscle, Nigel de Jong made a sensational return to the Dutch midfield on a cool, overcast evening in Sao Paulo. The AC Milan enforcer quickly set about tracking Messi the length and breadth of the pitch, but it was Argentina who enjoyed the best of the first half. Messi fired a free-kick through the Dutch wall but it was stopped by Cillessen, while Ezequiel Garay headed over at a corner. Van Gaal sent on Daryl Janmaat for Bruno Martins Indi at half-time, while de Jong soldiered on until the 62nd minute before giving way for Jordy Clasie, who came on to make his first appearance in Brazil. 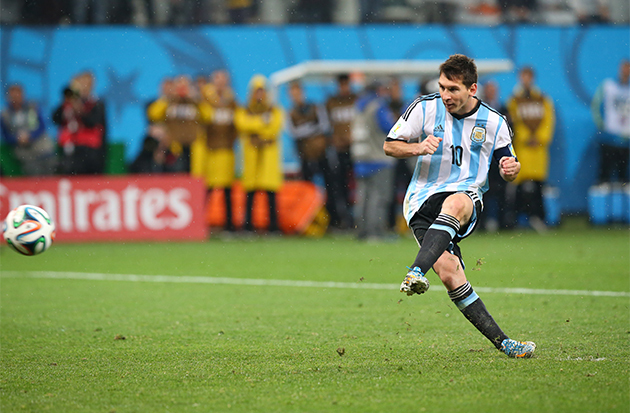 As a steady rain began to fall, the game settled into a disjointed rhythm, with Argentina continuing to look the more threatening side. Enzo Perez, deputising for the injured Angel di Maria, was a steady source of enterprise and he almost teed up Gonzalo Higuain for the opener with a glorious cross that the Napoli man poked into the side-netting. Sabella sent on Rodrigo Palacio and the fit-again Aguero towards the end of normal time, but his side only made it to extra time thanks to a sensational sliding block by Javier Mascherano to deny Robben on the stroke of full-time. Van Gaal had triumphed by bringing Krul on for the penalty shootout against Costa Rica, but this time he turned to striker Klaas-Jan Huntelaar, who replaced the shot-shy Robin van Persie. 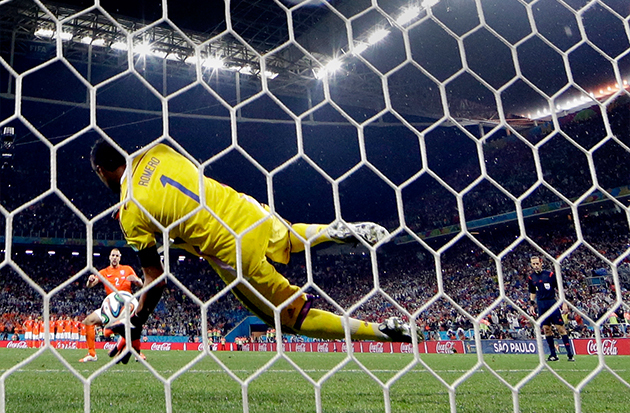 Holland belatedly registered a shot on target in the 99th minute, Romero saving from Robben. Palacio and Maxi Rodriguez both squandered chances late in extra time for Argentina, but thanks to Romero, it mattered not.